When the standard GS350 debuted at Pebble Beach, we reported that a GS350 F Sport version would bow at the SEMA show in Las Vegas. This has now come to pass. F Sport, of course, indicates this car’s sporty intentions; the letter F is similarly applied to the LFA supercar and the rowdy IS F sports sedan. The new GS model sets itself apart from the regular GS350 with unique fascias and spoilers, plus a set of 19-inch wheels that will be staggered to accommodate fatter rubber out back (at least on rear-drive models). 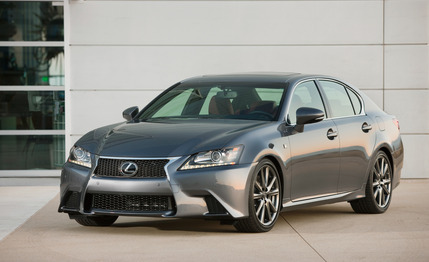 Those who might have hoped the F Sport badge would mean more muscle from the GS’s 3.5-liter V-6 will be disappointed. The direct-injected engine makes the same 306 hp as the regular car, and Lexus claims it can power both versions to 60 mph in 5.7 seconds. The F Sport conversion does bring significant chassis tweaks, though, including thicker anti-roll bars, firmer bushings, and an F Sport adaptive variable suspension system, along with larger front brake rotors and more aggressive brake pads. Rear-wheel drive is standard, while all-wheel drive is available. The F Sport offers a suite of optional gizmos intended to increase handling prowess. A new Lexus Dynamic Handling (LDH) system monitors velocity and driver inputs to optimize the car’s drift angle—basically, to minimize understeer and control oversteer. The LDH system also includes rear-wheel steering, which works like similar systems from other automakers by steering the rear wheels in phase with the fronts at high speeds or out of phase at low speeds to assist with turn-in and mid-corner stability. The rear wheels can steer as much as two degrees. Cars with rear-wheel drive get a new variable steering ratio; when the rack is paired with LDH, front and rear steering are independently managed in active pursuit of neutrality. 1000 hp Twin Turbo, Lexus IS300 drifting, VW bug, Supra videos!